Description: Having a tough time correlating the Last Tax Update date with the actual Payroll Tax Round number released by Microsoft? 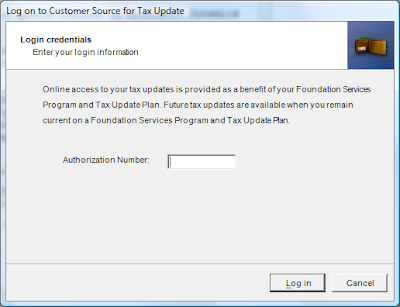 Remember, you can always use the automated tax update feature in Microsoft Dynamics GP to get the latest tax updates. 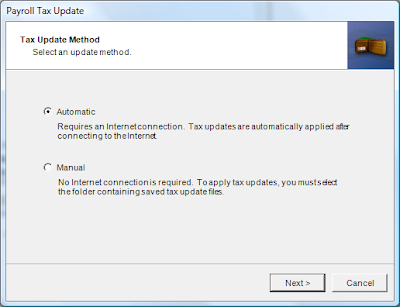 1) Go to MSDGP > Maintenance > US Payroll Updates > Check for Tax Updates, and choose the Automatic update mode from the wizard. 2) Enter your company Authorization Number (usually your main phone number) to continue. Click on the Log in button to continue. 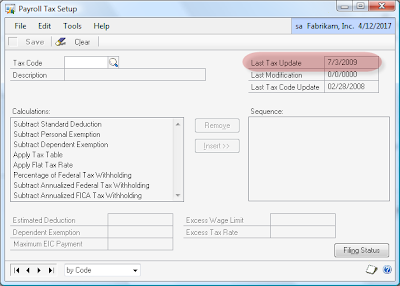 Dynamics GP will then download the latest tax update and apply the latest fixes required to fix bugs found in processing of payroll taxes.